Sunday, July 30th was the first of three Baltimore Ravens‘ open practices for the fans. Many fans got to see some familiar faces, and new players. There were different sessions going on in different areas of the field. The fans got to see the new jumbo screen that replaced the smaller ones. During the first session, the defense worked on drills on one end of the field. The offensive linemen worked on another part of the field. There was plenty to watch on the field and the screen. The defense won the game as far as points. Rookie Marlon Humphrey was very impressive in man coverage. He is showing great promise, but it’s only training camp – time will tell when it comes to live play. Another rookie who made a nice grab for a touchdown was WR Tim White from Arizona State, pass was thrown by David Olson. He also threw a nice pass to Mike Wallace. The New Orleans Saints break out into a rendition of “O, Canada” once again as they sign Canadian raised Orlando Franklin to a one-year deal. Franklin is a Jamaican-born professional football guard raised in Toronto who now plays for the New Orleans Saints. This veteran guard started all 16 games for the San Diego Chargers last year. Franklin’s release this offseason by the Chargers was seen as a cost-cutting move. But the truth may lie deeper than that. Prior to being on the Chargers roster, he was an offensive lineman for the Denver Broncos. With the Broncos, he excelled in their zone-blocking scheme; whereas the Chargers employ a power-gap scheme. With the 2017 season upon us the Rookies have reported to camp to get acclimated to their new home for the next 7 months. Quarterbacks and the rest of the veterans are starting to show up . The main focus this season will be the offense. We need players to step up, be leaders and be vocal. There will be position battles especially on the offensive line. The competition for the Center position, the Defensive End and the Wide Receivers. Also, who will be our Punt Returner/Kick Returner with Michael Campanaro on the PUP list. This training camp will be a test for everyone on how our season will be. Fans will get to see the players at M&T Stadium starting July 30th and two more times before the season starts. This will be a make or break season for some to either make the 53 man roster or make it to the practice squad. Offseason Buzz: Is this (finally) the Jaguars Year? After their fourth consecutive losing season in 2014 (3-13), the Jacksonville Jaguars made some big moves in the offseason. The team drafted Dante Fowler Jr and TJ Yeldon and landed Julius Thomas and Jared Odrick, among others, in free agency. The additions were deemed a giant leap in the right direction. What followed, however, was yet another losing season (5-11). That was followed by a second busy summer of transactions in 2016. Jacksonville acquired Tashaun Gipson, Chris Ivory, Malik Jackson, and Jalen Ramsey, and many pundits declared that the Jaguars had ‘won’ the offseason. They were widely considered the dark-horse of the AFC. What followed was yet another losing season (3-13), their sixth consecutive. Now, ahead of the 2017 season, the team has spent big in free agency again, acquiring Calais Campbell, AJ Bouye, and Barry Church, and brought in another top draft pick in the form of stud running back Leonard Fournette. But there is some hesitancy to board the Jags’ hype-train. Optimism has been tamed because we’ve seen this movie before. 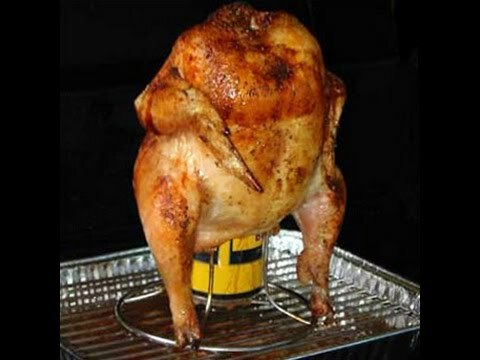 What says “grill master” more than grilling a whole chicken sitting on top of a can of beer that is infusing flavor and moisture into your bird? Beer-can chicken is often overlooked on the menu, but it’s a fun and proven way to grill a tasty whole chicken. Grab a whole chicken from the grocery store and beer, or even some root beer or soda, and get that thing on the grill for a guaranteed successful meal. This is an easy method for grilling a flavorful and tender chicken that keeps all eyes on the grill, and provides that “wow” factor for any cookout you host. Sure, it’s called “beer-can chicken,” but that doesn’t necessarily mean you have to use beer. There are tons of flavorful canned beverages out there, if you are so inclined to something else.